Just another update on the farm. The centennial vines on the bottom row have finally taken off. Unfortunately, rabbits continue to beat on the new chinook section. One mound was even dug up completely. There's nothing I can do for that one this season. Next year, the bottom row will receive more attention to protect them from rabbits. 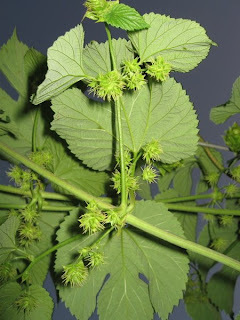 Below shows before trimming. I used all of the trimmings to border the new chinook plants for protection. 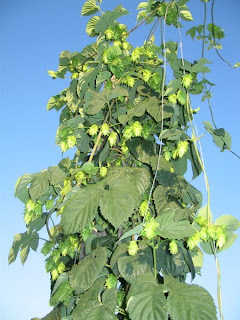 Chinook is doing well with hops. 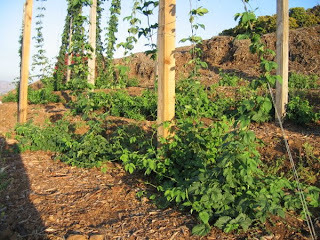 Below shows the hop density with many more on the way. I picked about one ounce that was ready but most need another week or two. Just have to wait until the cones are lighter and paper-like. The chinook has just started its second flowering and its really an explosion! I don't think they have flowered with this kind of density before. Below, you can see a cluster area of new cones.